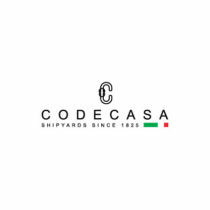 CODECASA YACHTS is an Italian shipyard founded in 1825, with an established reputation as a prominent yard in the luxury yachting industry. Codecasa builds luxury motor yachts from 98′ to 229′ (30m to 70m) in length. Every custom yacht is built with the latest innovations in style, quality, functionality and skill. World-class new yacht construction by Codecasa includes the 213′ (65m) DOUBLE DOWN, 205′ (62.5m) APOGEE, the 164′ (50m) GAZZELLA and more. As a premier luxury yacht builder, Codecasa yachts works with the world’s finest interior and exterior designers including Vincenzo Ruggiero, Franco & Anna Della Role, Sforzi & Manfredi and others, to create a yacht with thoughtful precision and detail to the client’s liking. Browse the entire fleet of Codecasa yachts for sale or find a Codecasa yacht for charter below. For more information about Codecasa yachts for sale and your own custom tailored yacht report, or to book a Codecasa yacht for charter, simply contact the Merle Wood & Associates luxury yacht brokerage firm.